Your mind is your biggest asset on the golf course, but only if you use it in the right way. When you’re assessing your shot, thinking about it, weighing the options logically, is the wrong way, but that’s probably what you do. Instead, take a more intuitive approach. Let the part of your mind that knows what to do make your decision. The problem a golf shot presents to us is how to project an action into a defined space. We’re doing something here that shows up over there. The question is, what should we do, and what is the easiest way to do it? Reverse that process. Look at the course without judging and let the course project a shot back to you. Look at the course in the area of where your next shot should end up. Just look, without judging. In a few seconds you will become aware of the shot to hit, and how to hit it. You won’t visualize it, like a movie. Your mind mind creates a wordless knowing, unaccompanied by an embedded or overlaid visual impression. That strong impression moves out of your mind to be literally felt in your body. It is also accompanied by great confidence. I use this process with great success everywhere, but especially around and on the green, where there are so many options to choose from for the same shot. A few weeks ago, my ball was just off the green. I looked at the shot and said to myself, “9-iron.” But I usually chip with a sand wedge in this situation, so I got out my sand wedge. I took a practice stroke, and thought, “No, it’s a 9-iron.” I put the wedge back in the bag, took out the 9-iron, stood over the ball and just let the shot come to me as i described above — where to hit the ball and how hard. I hit a gentle chip, and the ball curved into the hole. I could tell you many stories about driving, approaching, and putting where this technique has paid off famously. 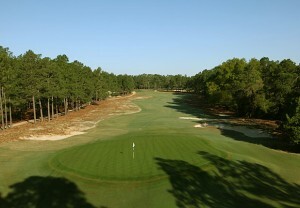 It doesn’t mean the ball will go into the hole from wherever you are, or that you’ll hit every fairway or every green. We are human, we make mistakes in execution. But it does mean that you’ll play much better than you thought you could. Quiet your thinking mind to let your intuitive mind tell you what to do. You’ll be pleasantly surprised. Interested? 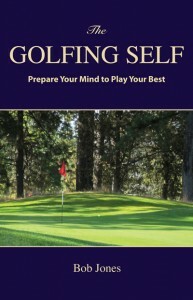 My latest book, The Golfing Self, gives you detailed instruction on how to train your mind to play this way. You’re a better golfer right now than you think you are. Find out how to let your true ability emerge by using your mind correctly. Do you play one golf course all the time? Try going to different courses. 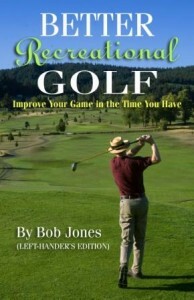 You’ll get more fun out of golf, and you’ll become a better player. Here’s what happens when you play the same course over and over. You get into something of a rut. You don’t have to think too much, because you know just what strokes to play on a particular hole to get your 4. The only challenge is to see if you can do it. Even though you play a good course, it does not require all the shots you need to be a complete golfer. You never get the chance to learn something new. And when you do go to a new course, you probably have to hit shots and use clubs you have little experience with, and you often hit the wrong shot because you haven’t learned how to read a hole. A subtle danger is that you might be under-handicapped by playing only one course. Since you know it so well, you play it so well. A few years ago, a local amateur shot a 62 on his home course. I looked up his scores in the GHIN website and found that all twenty of his handicap scores were on the that same course. I wonder how well his handicap of 3 would travel. I play on five different courses, each one of which demands different shotmaking from the fairway and around the greens. Playing well on one makes me a better player on the others, to boot. 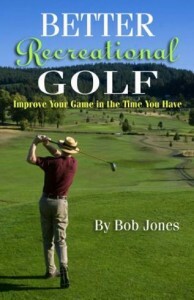 I throw in a new course every so often, to keep my course-reading muscles flexed, and thus I feel I can go anywhere and play a creditable round of golf right off. The golfer who has learned to adapt his or her skills to any course and still play his average game is getting the most out of this great sport. I would hope that’s the kind of golfer you want to be. Let me tell you the easiest way to hit the ball straight and hard. Swing the club with your hands. Not your body, not your arms. Your hands. This was once the way people played golf. Now you’re supposed to swing with your large muscles in order to have a consistent swing. But think for a moment. When you pound a nail into a board, what do you swing the hammer with? Your hand! When you swing a tennis racket, you swing it with . . . your hand! Get this: a few days ago I asked to the manager of our local minor league team how he teaches his players to hit the ball. He said, you’re hitting with your hands, just like driving a nail with a hammer. It’s the same with a golf club. Humans have evolved hands that are wired to do complicated and precise activities. Use them! That’s what they’re for! Getting the clubhead back to the ball headed toward the target and with the clubface square to the path, all at many MPH, is a task requiring the utmost precision. Tasks of utmost precision are what your hands are designed to accomplish. This is how to do it. Take the club away from the ball with both hands. That means your mind is on the movement of your hands, and no other part of your body. When you swing down into the ball, your mind is on your hands delivering the club precisely to the ball. More to the point, the left hand guides and the right hand delivers, both at the same time. Really, that’s all you have to do. Swing with your hands and your body will follow. A few caveats. This does not mean rear back and slug the ball. Far from it. You still use the golf swing you have now, but with your mind on what is really doing the work. You still need to have good pre-swing fundamentals (grip, stance, posture, alignment, ball position, aim). You still need good rhythm and tempo. Also, you don’t hit at the ball. You swing through the ball, with your hands leading the clubhead into the ball. And you swing with both hands, not just your right. They say your hands should be passive. Nice thought, but they never are. That’s because they want something to do. And if you aren’t paying attention, they’ll do something wrong. Best to give them something to do that is the right thing. Let them take over the swing. That’s what human hands are meant to do. Since I started doing this, I hit one straight shot after another. I’ve taken four strokes off a round (no kidding! ), all because I’m swinging the club with the part of my body that was designed for this job. The key to playing good recreational golf is to hit the ball straight. Distance is fine, but hole in, hole out, straight is the goal. Hit into the fairway, and onto the green, and you can shoot lots of good scores. Hitting straight is not easy. It takes dedicated practice to become a straight hitter. I want to give you four points to work on that will take you a long way in that direction. If you put these points into your swing, I guarantee good things will happen.